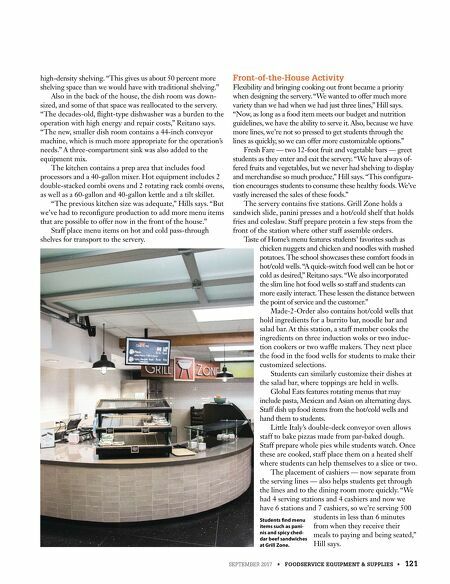 120 • FOODSERVICE EQUIPMENT & SUPPLIES • SEPTEMBER 2017 facility design p r o j e c t o f t h e m o n t h "This project was an investment in our students and their health," Hill says. "More students are eating, which increases revenue, and it also ensures us that students are consuming healthy meals." 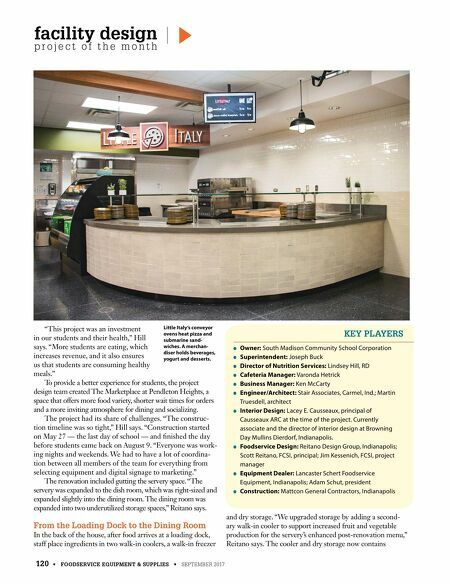 To provide a better experience for students, the project design team created The Marketplace at Pendleton Heights, a space that offers more food variety, shorter wait times for orders and a more inviting atmosphere for dining and socializing. The project had its share of challenges. "The construc- tion timeline was so tight," Hill says. "Construction started on May 27 — the last day of school — and finished the day before students came back on August 9. "Everyone was work- ing nights and weekends. We had to have a lot of coordina- tion between all members of the team for everything from selecting equipment and digital signage to marketing." The renovation included gutting the servery space. "The servery was expanded to the dish room, which was right-sized and expanded slightly into the dining room. The dining room was expanded into two underutilized storage spaces," Reitano says. From the Loading Dock to the Dining Room In the back of the house, after food arrives at a loading dock, staff place ingredients in two walk-in coolers, a walk-in freezer and dry storage. "We upgraded storage by adding a second- ary walk-in cooler to support increased fruit and vegetable production for the servery's enhanced post-renovation menu," Reitano says. The cooler and dry storage now contains ● Owner: South Madison Community School Corporation ● Superintendent: Joseph Buck ● Director of Nutrition Services: Lindsey Hill, RD ● Cafeteria Manager: Varonda Hetrick ● Business Manager: Ken McCarty ● Engineer/Architect: Stair Associates, Carmel, Ind. ; Martin Truesdell, architect ● Interior Design: Lacey E. Causseaux, principal of Causseaux ARC at the time of the project. Currently associate and the director of interior design at Browning Day Mullins Dierdorf, Indianapolis. ● Foodservice Design: Reitano Design Group, Indianapolis; Scott Reitano, FCSI, principal; Jim Kessenich, FCSI, project manager ● Equipment Dealer: Lancaster Schert Foodservice Equipment, Indianapolis; Adam Schut, president ● Construction: Mattcon General Contractors, Indianapolis KEY PLAYERS Little Italy's conveyor ovens heat pizza and submarine sand- wiches. A merchan- diser holds beverages, yogurt and desserts.